There are many people in the world who aren’t concerned with finding reasons why something might not be possible. They may not even be aware that there is such a thing as personal limitations as they forge forward with ideas and actions that seem impossible to many. 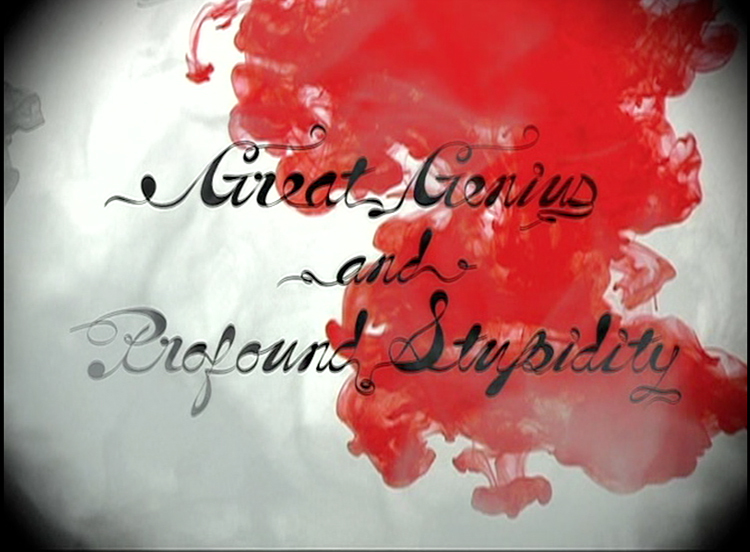 Benita Raphan’s film Great Genius and Profound Stupidity examines the likeness of those in the world who live life with few mental limitations—determining whether this is due to extreme genius or stupidity is up to the viewer. Narrator, philosopher Avital Ronell reveals how these concepts, although they seem opposed to each other, are twin concepts and, once it is fully considered, it is hard to determine the difference between the two. Michel Foucault, in The History of Madness, also touches on how the act of society’s judgement on a person’s behavior can affect whether a person is deemed insane. In all cases, the assessment is based on our experience of a person who doesn’t seem concerned with living by the structure that is enforced by most of the systems we create to maintain order. Raphan references the book Flatland by Edwin A. Abbott who writes how visionaries see things from above, as if they are removed from the system they exist in. This aerial view allows them to see the world as something to be adapted, rather than adhered to. Through her interviews with Ronell, Oliver Sacks, Merce Cunningham and a child math genius, along with an insight into mathematician Paul Erdos, Raphan reveals a side of human nature that continually moves forward, without restrictions of doubt (that we know of). Ronell, in her own writing, has discussed how creativity and the act of writing sometimes enters a zone of unknowing, where the creator is unsure of what is happening or why but forges ahead, nonetheless. This act has the creator approaching the edge of his or her capacity and toying with the idea of stepping over that edge from a social, involved self, to one who ventures into the possible realm of the insane, such as the writer Nietzsche or the artist Van Gogh. Recognizing that this trait of uncovering the new is how we tend to identify genius opens up speculation on what exactly is genius versus someone who is incapable of living within a structure. Maybe they are the same? What differentiates this genius from a person who is uneducated enough to not know to have limitations? In Raphan’s film, Ronell gives the example of Joan of Arc, who was illiterate but who passionately believed she was being guided by God to lead the French Army. Was she insane? A devout genius? Or was she profoundly stupid enough to follow her beliefs, even if it meant sacrificing her own life? Raphan manages to throw all of these concepts into question, leaving one with a sense of insecurity about what we previously believed to be a genius. We end up stuck in the very liminal zone that some of these people may always exist in—one full of skepticism, wonder, inquisitiveness and with a vision of something new.